Also known as Varnava of Hvosno was auxiliary bishop of Hvosno. Varnava was born Vojislav Nastić in Gary, Indiana, on January 31, 1914 into a family of Serbian immigrants. His father and mother were Atanasije and Zorka Nastić and the family attended the St. Sava Serbian Orthodox Church of Gary, Indiana which is now located in Merrillville, Indiana was the place where Varnava was baptized, served as altar boy, and was first recognized as a youthful prodigy in reciting Serbian folklore and old ballads. When Vojislav was a child, his parents returned to their homeland. Vojislav attended high school in Sarajevo, graduating in 1933. He continued his education at the University of Belgrade’s Faculty of Orthodox Theology, graduating in 1937. After graduating he taught as a catechist in two high schools in Sarajevo. In 1940, Vojislav took monastic vows in Mileševa Monastery, receiving the name Varnava. Varnava was ordained hierodeacon by Metr. Petar of Dabar-Bosna. Dn. Varnava remained in Sarajevo during World War II. Croatian fascists, however, tried to force him to join the “Croatian Orthodox Church” which they had organized to subvert the Serbian population in Croatia and Bosnia-Herzegovina. Dn. Varnava categorically refused this. Soon he had to leave Sarajevo in order to save his life. After war he was ordained hieromonk and raised to the rank of protosyncellus by Bp. Nektarije of Zvornik and Tuzla. In its first regular session, the Holy Assembly of the Serbian Orthodox Church elected Fr. Varnava auxiliary bishop to the Serbian Patriarch with the title Bishop of Hvosno, with the responsibility of administering the Diocese of Dabar-Bosna. He is consecrated by Patriarch Gavrilo, Bp. Nektarije, and Bp. Vikentije of Zletovo and Strumica on May 20, 1947. In his new position Bp. Varnava began openly criticizing the new communist regime for mistreating the church. He was soon arrested and sentenced to twenty years in prison. To support the accusation that he was an American spy, it was presented as evidence that he was teaching his sister English so she could be used as a spy for the Americans. Bp. Varnava was subjected to torture, lack of food, and was kept in the most isolated wing of the prison. But Bp. Varnava remained calm. Every day he sang the troparia and other hymns. The communist Government even arranged an accident in order to get rid of him in which he broke his leg. Although the communist secret police, OZNA, did not allow doctors to provide him any medical help, he recovered. He was released after accident to house arrest in the Gomionica Monastery in the Diocese of Banja Luka until his release in 1960. He died on November 12, 1964, in suspicious circumstances, leading some historians to believe that he was poisoned by OZNA. 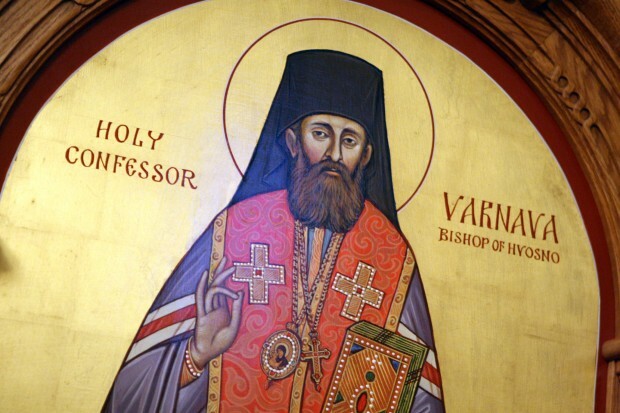 In 2005, during the regular session of the Holy Assembly of Bishops of the Serbian Orthodox Church Bishop Varnava was canonized and his name was added to the list of other saints of the Serbian people and of Orthodox Christian faith.